Stuffed Elephant Sewing Kit - DIY Make Your Own Felt Animals! Sew Your Own Felt Stuffed Elephant! With this DIY craft kit you can create your own heirloom quality felt stuffed elephant with sewn in wire for a pose-able trunk! This craft project is meant to be hand stitched, making for a perfect craft on the go! Everything you need to make your stuffed elephant can be found in a nifty kraft paper box! This kit comes packed in a 5″ by 5″ kraft paper box. The materials included are enough to create one 4 inch tall by 5.5inch pose-able felt stuffed elephant. The finished elephant will be a heirloom quality felt toy! Give the finished elephant or the kit itself as a gift! My kits and patterns are made to practice the art of hand stitching! Basic hand stitching skills are helpful, but not required. 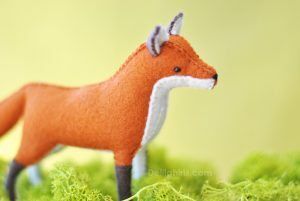 This is the perfect project to learn to stitch and to learn to make handmade toys! Each kit comes with a hand stitching diagram insert.